One of my favorite summertime dinners is grilled vegetables. I delight in lighting the mesquite charcoal and piling as many vegetables as I can fit onto the grill. This particular evening we grilled carrots, zucchini and a whole head of garlic. Carrots are topped with olive oil, scallions and bush basil. The zucchini has a gremolata style sauce made with parsley, garlic, olive oil and lemon. After cutting your vegetables brush all sides with olive oil and set aside. Once your charcoal is ready or your grill is hot begin with the carrots. Carrots take a good 15 minutes longer to soften up then the zucchini. My grill was far too hot and the carrots started to char. Turn frequently to prevent too much charring and move to a cooler area of you grill. If they do char too much you may use a peeler to peel away the black areas once they cool off. After 15 minutes add the zucchini to the grill and cook 15-20 minutes until tender and brown. Remove from the grill and toss with your herbs and dressings. Using a food processor, whizz 3 tablespoons of olive oil with handful of parsley, two garlic cloves and 3 tablespoons of lemon juice. Add a little salt and toss with zucchini. Where have I been? I have been buying herbs for years and particularly basil. This is the first year I have seen this basil varietal. The leaves are very small and have a slightly floral aroma. I have seen these trimmed into a cute little topiary trees. Mine stands about 14 inches tall. I purchased it at the farmer’s market for $2. As you can imagine, I was thrilled. simple, healty and yet tasty dish…. Oh wow. I hadn’t heard of bush basil before this season. I’m really enjoying it! Beautiful BBQ side dishes, can’t wait to try them! Doesn’t get any easier than this….grilled vegetables. Keep an eye out for this basil. It’s quite remarkable. Seriously, we don’t even bother putting any “meat” on the grill when we make so many vegetables. 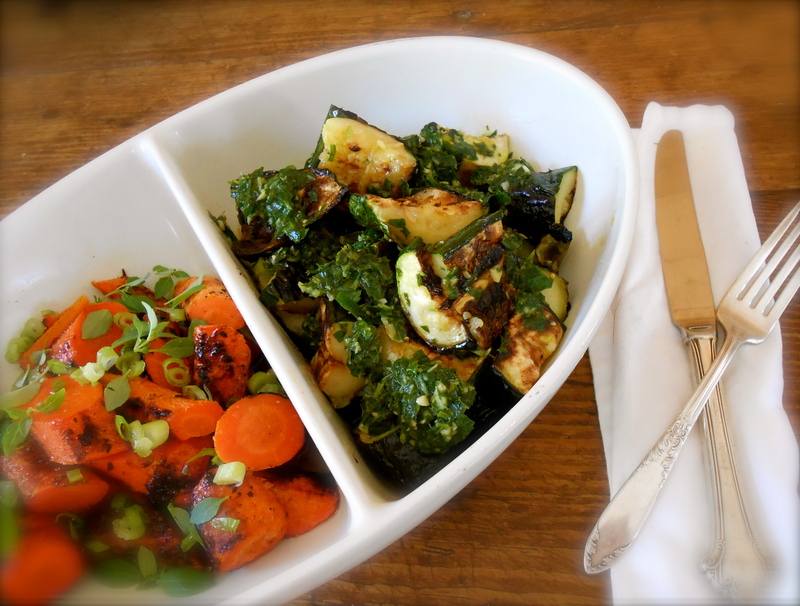 There is nothing like grilled vegetables, love the combination and especially the gremolata. Perfect summer meal! Cinnamon basil? Wow. Interesting. Did you smell or sample a leaf? The leaves on this bush basil are approximately the size of my thumb nail. So mini and it really packs a flavor punch. No I didn’t get to sample it a lady was watching over me like a hawk…lol!! Our basil gets about the size of the inside of my palm. Your little basil sounds so good! What a perfect summer meal. Oooh. That’s sounds so good! Maple and orange together sounds like a great combination for carrots! Your bush basil looks the same as my Greek style I bought a while back. Don’t know why it’s called that in the UK. Anyway, very easy to slip. I had several small branches inside a large, tall glass as a table piece and they took root after a couple of weeks :) I’ve just potted them on. It seems to be really hardy as herbs go. And a perennial, apparently. – Loving the idea of your grilled veg! I don’t have access to any outdoor area anymore so I’ll just have to imagine how good they were. Grilling vegetables is my favorite way to prepare vegetables too. Seems like the carrots were always turning black before they were soft. Then it occurred to me to peel them just as roasted red peppers. I also thought about giving them a good steam prior to the grill just to jump start the cooking. Grilled veggies are the best! Try them with a splash of balsamic vinegar as well, yum! Oh and red bell peppers, they are fab grilled. what a beautiful basil plant (and only $2)! Does it taste similar to “regular” basil? he rooted a little bunch in water then potted it! I love grilled veggies and funnily enough, I have yet to grill carrots! Will definitely try them next time. I can eat these 2 dishes everyday. This is the first time i am seeing a greek basil. How different is the taste as compare to sweet basil? HI Danny. The taste is still very much basil, however, to me it seems to be far more pungent and intense. I can almost smell a little sweet floral scent. I haven’t made pesto with it yet. I used it on many other dishes and it was particularly good on caprese salad. If you have an opportunity to pot one you would really enjoy it. I’m not sure if you have tasted Thai (Thailand) basil before but the look and the way you describe it sounds close. I have. This does seem very close to Thai Basil except the leaves are smaller and softer too. I really like Thai Basil. Super yummy! I have so many carrots we’re picking right now and have been enjoying them steamed.. but now I need them grilled! Yes, this recipe is right my alley! Guess what? 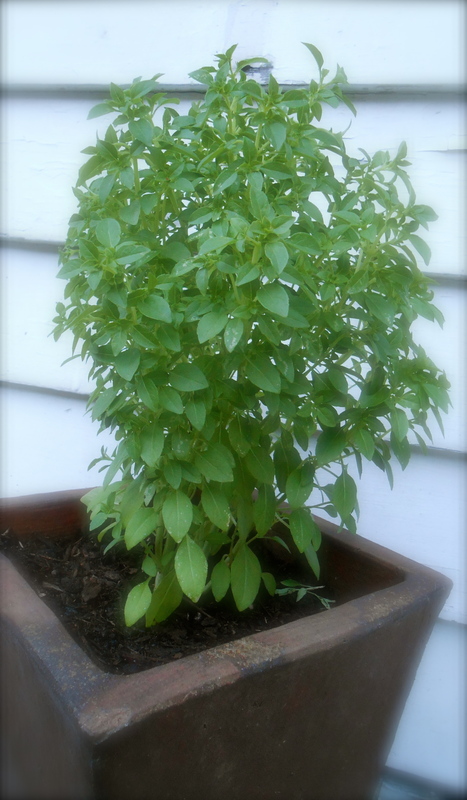 I just bought a pot of basil too – from Trader’s Joe of all places and it is quite big and nice but yours is much more lush and much cuter. I always admire the basil pots at Trader Joe’s! And they are usually priced right too. I can see making it through a whole summer of cooking with one of those pots…well, unless you make a pesto which may require the whole plant! Nothing beats grilled veggies for taste, simplicity and versatility :) I love that you can pair them with just about anything! You are currently reading grilled carrots and zucchini at COTTAGE GROVE HOUSE.